IGRAINE® Flap Disc Sanders are available in three grits. Use Lancelot® and Squire® for mass removal and rough shaping, then use Galahad® or Holey Galahadto smooth down the ridges, Igraine® flap discs for major surface area sanding and finishing, then complete the project with Guinevere® to obtain a super fine velvet touch finish. Apply your liquid or wax finishes after either Igraine® or Guinevere®, depending on your choice of surface grit finish. 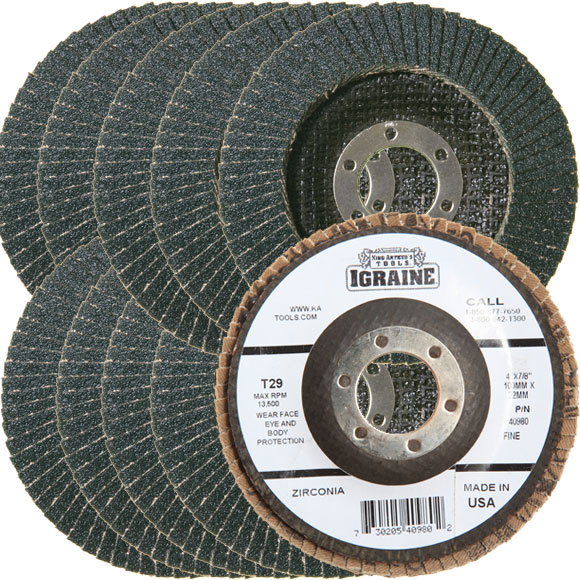 Specifications: Available in 24 grit (coarse), 60 grit (medium) and 80 grit (fine) in both 5/8” (16mm) and 7/8” (22mm) center holes to fit American and European 4-1/2” 115mm to 125mm angle grinders.